There's a nifty trick on the Flickr Tools page that enables you to upload images to your Flickr photostream via email. This can be a great boon for road warriors who have photos to share, but don't have their personal computers with them. All you need is your image and any web mail account (such as Gmail), and you're ready to publish. I've been using this technique to publish images directly from my iPhone while on the go, and it works great. On the Flickr Tools page, look for the link "upload by email." Make sure you're logged in to your account before proceeding. Once you click on the "upload by email" link, Flickr will take you to a new page and generate a personal email address that you can use to upload your images. Simply open a new email, attach the photo, address it, and hit the send button. You can add a title to the image by entering text in the Subject line, and add a caption by entering text in the body of the message below the photo (if your photo is displayed in the body of the message). It couldn't be easier. People with Treos, iPhones, and other email-enabled mobile devices will find this particularly useful for uploading pictures while on the go. And don't forget to check out the The Digital Story Flickr Public Group. There's lots of great stuff going on there. A few of us at the Microsoft Pro Photo Summit had the opportunity to go shooting with John Shaw at the Washington Park Arboretum near Seattle, WA. During his talk in the field, John shared some of his favorite equipment tips. Among the best was the Really Right Stuff BH-55 ballhead with Arca-style quick release. 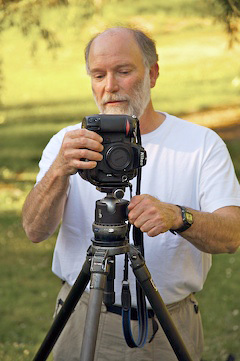 John uses an L-Plate designed for his camera to enable him to shoot in the vertical position without having to dip the ballhead downward (as shown in the illustration). The L-Plate enables him to quickly mount his camera from the bottom or the side giving him maximum flexibility. It's very cool, and if the entire set-up wasn't so expensive (RRS ballhead + AS quick release + L-plate), I'd have one today. Now that my photo buddy Mikkel Aaland has sent his Photoshop Lightroom Adventure book to the printer, he's had a little time to put together a terrific PDF download titled, The Lightroom 1.1 Library Revealed. It's a quick tour of the key elements of the Lightroom 1.1 Library module, including an explanation of the new "catalogs" (formerly known as libraries) concept. Very nice. Once again Fourth of July is at our American doorstep, complete with lots of fireworks displays. If you want to capture your own fiery composition, here are a few tips. First: turn off your flash. Yes, you're going to be shooting in a dark environment, and if your camera is set to auto flash, it's going to fire. This is the last thing you want, so turn it off. Next, break out the tripod. You're going to be using long exposures. Use a cable or remote release if you have one. If not, just gently press the shutter button with your finger. Resist the urge to increase your ISO setting. Keep it at 100 to help reduce image noise. You might also want to switch to manual exposure. Auto exposure will overexpose your dark skies turning them to mushy gray. Start with a manual setting of 2 seconds at F-5.6 or F-8, and see what you get. Adjust accordingly from there. Finally, use a wide angle lens so you can capture as much of the sky as possible. If you know the display is going to peak in a certain area, you can zoom in a bit. Remember, since you're shooting at the highest resolution possible, you can always crop your image later. Have a great time, be safe, and get some great shots. 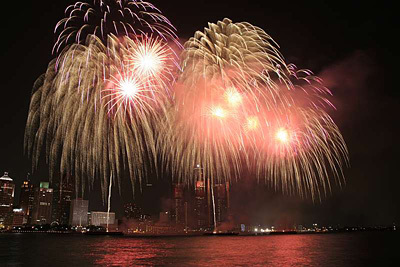 Brian C Davenport went to Windsor,Canada to shoot the Freedom Festival fireworks over the Detroit skyline last year. Here's how he got the shot. "It was a very long day but the last 30 min was outstanding," said Brian. "Getting there early in the day gave us a front row seat, right on the shoreline to set up our tripods. I shot about 200 images during the day, and the fireworks shots came out really nice. It was a little tricky as this was a show where there were very few single bursts so there was alot of light in the air most of the time. I settled on 18mm, ISO 100, f8 and 3-5 sec exposure. These settings gave some definition to the bursts without too much "blow-out" of the highlights." Great shot Brian! Thanks for sending it in. Want to learn new photography tips and tricks firsthand? I have a number of teaching and speaking events lined up for 2007, and I'm going to publish monthly updates here on TDS. I've also created an Events Calendar so you can peek ahead, especially if you're planning a trip to Northern California. This highlight for July is the Sony/Pop Photo Digital Days coming to Sheraton Gateway Hotel, 600 Airport Blvd., Burlingame, CA 94010, (650) 340-8500. I'll be speaking on Lightroom on the 21st and CS3 on the 22nd. In August, I have an all day workshop in Santa Rosa on Aug. 18 titled, I've Taken Great Photos, Now What?. You can sign up at the SRJC Community Ed page. I highly recommend this event. You'll have a great time and get plenty of information for your post production workflow. Sign up today! If you see something on the Events Calendar that you like, you can email me first to confirm the date and find out additional details. My contact information is on the Submissions page. You can send pictures you take with the iPhone via the device's Mail application. Your image is sampled down to 640x480 and added as an attachment. You have no other wireless option for sending your pictures. That being said, email is very easy. 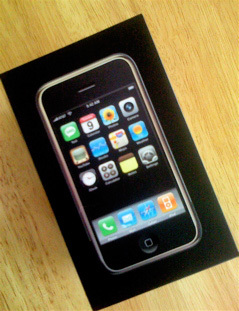 The iPhone does, however, communicate well with iPhoto (Mac users only). Connect your iPhone, and it shows up as a tethered camera in iPhoto's Source pane. When you download the images to iPhoto, they come in at the full 1200x1600 resolution. Unfortunately, you don't get any substantial metadata other than the f-stop. So you have no idea about shutter speed, ISO, or focal length. Taking pictures with the iPhone couldn't be simplier, too simple in fact. You have no settings or preferences at all, so you can't adjust the white balance, ISO, or even use a self-timer. Just point the camera and click the shutter... that's it. I certainly can appreciate Apple's efforts to keep things simple. And I'm hoping that we get more functionality up the road via software updates. But if you're a big camera phone shooter, you will probably be disappointed with this device as it ships now. We'll see what the future brings. Shown here is a sample photo I took in the shade of a patio in the middle of the day. I'm guessing that I was too close to the subject for precise focus, and I had no focus confirmation while attempting the shot. So this is what I got. I do like the big viewing screen for capturing and viewing photos, and if I had just a few controls, I think I could overlook its other shortcomings. In the meantime, I think I'll watch some YouTube videos. I've been testing the Panasonic DMC-FZ8 for a few months now, and I've just discovered a review on Camera Labs that echos many of my findings. 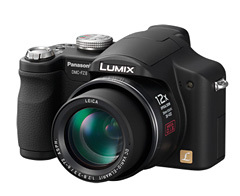 If you're interested in the FZ8, I recommend that you go over to their site and read up on this nifty Panasonic camera. Overall, I like the DMC-FZ8 because for about $298 US you get a 12X Leica zoom lens with a maximun aperture of f-2.8, Raw mode that can be read by Lightroom 1.1 and Adobe Camera Raw 4, 16:9 aspect ratio for both movies and stills, long battery life, very light and compact body, electronic viewfinder, manual controls, live histogram, image stabilization, intelligent ISO, and a filter ring that is perfect for attaching a polarizer. On the downside, there is more image noise at higher ISOs (400 and up) than with a Digital SLR (such as a Canon Rebel XTi) and Panasonic's noise reduction can be a little aggressive, resulting in slight smearing visible at 100 percent on a HD screen (but I haven't noticed it in prints). Both of these nits exist in almost all of the competitive models often costing more than the FZ8 (such as Sony's Cyber-shot DSC-H9). Also, the lens only goes as wide as 36mm, but extends all the way out past 400mm on the telephoto end. Bottom line, I love shooting with this camera at 16:9 in Raw mode using the long Leica telephoto lens. I think it's a perfect addition to your camera collection if you're looking for a compact super-telephoto that records in Raw. Adobe released version 1.1 of Lightroom today, and it includes lots of new features. My favorite, and probably the overall crowd pleaser, is Catalogs. Basically, this functionality enables you to create entirely new Lightroom libraries (even though they are calling them catalogs), then switch among them as needed. Choose File > Open Catalog... to change catalogs. I keep a basic catalog on my MacBook Pro internal hard drive, but I have larger, more extensive catalogs on external drives. 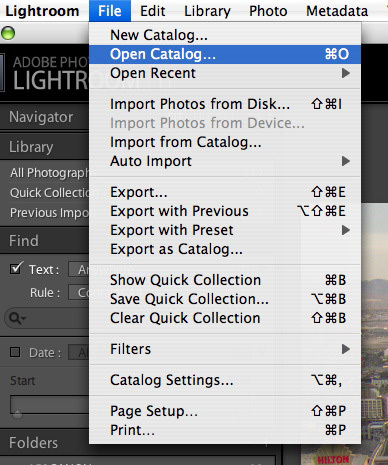 If I want to switch, all I have to do is use the File > Open Catalog command, and Lightroom takes me to a dialog box where I can navigate to the catalog of my choice. I have to then relaunch Lightroom, and presto, I'm looking at a whole new set of images. it works very well. 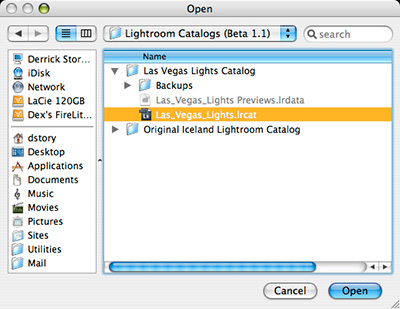 Then just select the catalog file you want to access, and relaunch Lightroom. My photographer friend, Mikkel Aaland has published a nice overview of his favorite new features over on Inside Lightroom titled, What I Like About Lightroom 1.1. Also, his book editor, Colleen Wheeler, has posted, Photoshop Lightroom Adventure Book Covers Lightroom 1.1. This is a book near and dear to my heart since I joined Mikkel on the Adventure, and I have images in the book that's soon to be released. I'll be talking lots more about Lightroom 1.1, but in the meantime, if you already own Lightroom, go download it... 1.1 is a free update. The hueyPRO: Affordable Color Calibration or Sophisticated Toy? In his review, I don't feel like Pasini gives the new huey a resounding endorsement. He does say, "The Pantone hueyPRO makes it affordable and easy to calibrate and profile your monitor, a good solution for the amateur photographer with multiple monitors who may not have the additional cash to go with a higher-end solution like the ColorVision Spyder2 Pro." Well, the list price for the ColorVision Spyder2PRO is $249 US, and the list for the new hueyPRO is $129. I use the Spyder2PRO and like the results, so I guess it all boils down to the price difference between the two devices (and possibly their portability with the hueyPRO taking less room in the laptop bag). However, I just checked on Amazon.com, and you can get the Spyder2PRO for $176. So you might want to read the Imaging-Resource review carefully to see if the hueyPRO is worth saving a few bucks. Rick LePage writes in his comprehensive comparison of Lightroom and Aperture, "While both Aperture and Lightroom perform the role of image manager and photo editor admirably, each program has plenty of unique features that set it apart. To determine which program is best for you, you’ll need to assess your work style and then choose the one whose features best support that process. I’ll lead you through the most significant differences and help you decide which will benefit you most." If you're a Windows user, I think you'll appreciate Rick's breakdown of Lightroom. For those on the Mac, the side-by-side comparison of features is truly helpful. Either way, Rick LePage's Aperture vs. Lightroom: The new digital darkroom is a must read for those considering either or both of these applications.